Late fall and winter is the time of year when many CSA subscribers groan with disappointment when opening up their box shares: what, kale AGAIN? what am I supposed to do with all this kale? Fear not. I have a salad that you might like to try, oh you-with-too-much-kale. It is eaten quite greedily and regularly by all members of the household, but my daughter in particular is terribly fond of it. 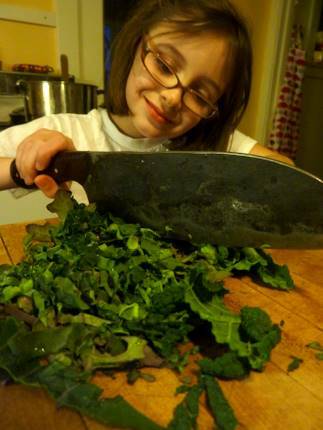 (Imagine that: a child who asks for a raw kale salad in her lunchbox!) And, bonus: it’s a fun salad for a child to (help) make, too. Take a good handful of kale leaves: we prefer lacinato (also known as black (cavolo nero) or dinosaur kale), but red, white or Russian kale works too; I haven’t tried it with a Vates (scotch, crinkled) but if that’s what you’ve got then by all means use it. Wash then stack the leaves (including stems if they’re not too tough) together like a stack of cards, and, if they are really wide, roll them together. Julienne by cutting them the short way into fine match-sized strips; if the strips are over an inch long, cut them again. Place the kale in a large, good-looking bowl. Toast in a dry skillet: a good cup or two of fresh breadcrumbs. The crumbs should be toothsome and not on their way back to being flour, so…avoid the food processor and mince the bread with a knife. Let cool. Pound to a paste in a mortar: as much garlic as you can tolerate (for us, five big cloves) with sea salt and pepper to taste. This is a fine task for a small person. Add the juice and zest of half a lemon, or more, and a good glug of olive oil; mix well. Pour the garlic mix over the kale and toss well, then toss in the breadcrumbs. Adjust seasonings, lemon, to taste. This salad should be good and garlicky, enough to scare off any vampire! It gets better as time progresses, too, so…you can macerate the chopped kale with the garlic dressing a day ahead of time and then toss in the toasted breadcrumbs right before serving. Variations: Toast sunflower seeds or chopped walnuts right along with the breadcrumbs. Add red pepper flakes to the garlic mix. Add as much hard grated cheese as you would like; pecorino has a nice salty bite to it. Feta is great crumbled on top, too. If it’s really too zesty for you, then tame your serving with a tablespoon or two of plain yogurt or sour cream and mix well. I LOVE lacinato kale and I am thinking it is the only variety I ever want to grow or eat again. But I try to avoid raw kale because I have low thyroid functioning and kale is a member of that darn goitrogenic brassica family. Dang. Maybe a quick trip in the pan after the breadcrumbs then for you, Shannon? You can toss the oil in first so it doesn’t stick. And yeah, lacinato does really well in our greenhouses all winter, unlike a lot of the other kales. That sounds really yummy. I love kale, but am having a hard time getting the family to try it. They might try this. Mmm, maybe I should go peek under the tunnels today. It is nearly 30 out there! This looks fabulous. We’re big fans of just about anything garlicky here. One of my favorite go-to vegetable is kale. So easy to grow and cut and come again, I grow it year ’round because I can. I love to sing the virtues of kale! My favorite way to eat it is with pasta, which is so good that I once fed the same dish to my husband three times in one week and he never complained. It’s the dish I rustle up when I’m so tired at the end of the day I can’t think, because I can do it half asleep. Anyway- I’m going to try this salad sometime too! My wife loved your zesty raw kale salad recipe and has commanded that I make it for her some day soon. :) It really does sound pretty darn good. That’s so great that she asks for greens in her lunch! Awesome. I meant to say, Shannon, thanks (?) for the new vocabulary word, too. My fast search kinda let on that it was only the raw brassicas that suppress thyroid function, is that true? Then maybe a quick sear would work for this salad for you…you can chill it later of course and rely on nuts or the breadcrumbs for the crunch. They just might, Mom, which is why I suggest add-ins like the nuts or–most importantly–the cheese! We have 3 different palates to humor in my house, where the girl likes it sour, I like my cheese and the husband likes it hot. Hi Sara. Winterbor is a crinkle (scots, vates) that should do well outdoors for you: they grow pretty low and the curling leaves are supposedly more cold-hardy. I don’t grow enough of it to say “yeah that’s what it does” but I will be trying more of it this year too. Have fun! Supposed to get slammed again with more snow soon…. Diana, exactly: garlic is the great unifier in my house too. I do swear if put garlic on a peanut butter and jelly sandwich it would gladly get eaten. Paula, I envy your year-round availability; it’s at best a 3-season plant for me (mainly because it shoots into flower in the spring). And yes, pasta. Soup too it always lands in soup, and pots of beans, yum! Thanks Meems! She brings some odd things in her lunchbox, that’s for sure. She’s on a sardines kick right now in point of fact. This salad looks great. I have been making a very similar one from Melissa Clark of the New York Times. It has more lemon and some parmesan cheese, and it is really great. If you put in the bread crumbs as you eat they stay crispy, but if you add extra olive oil and lemon juice, you can add the bread crumbs early and they will soak up the “sauce” and be really tasty. Here is the link to the salad. enjoy! I love your site.